Peg will have a selection of produce including: string beans, cucumbers, eggplant, garlic, kale, leeks, onions, parsley, pickles, sweet potatoes, white and red potatoes, zucchini, peppers, hot peppers, winter squash, and her dog treats! Bob will have a selection of his bake-at-home pizzas, including: Four Seasons, The Steakhouse, BBQ Chicken, and Three Cheese. He’ll have new batches of Janie’s Meatballs & 12-Hour Gravy, Tuscan ham & bean soup, and roasted chicken & mushroom soup. Email Bob at bob@bobsbakeathome.com to place your order in advance. Fresh cheese week! We will have new batches of fresh mozzarella, cheese curds, Greek yogurt and yogurt smoothies. We will also have all of our aged cheeses, and 8 cheese spreads too. Exciting news–we will be a tour stop on the Chester County Best Kept Secret Tour from Nov 24-Dec 8. Stop by to purchase tickets or find out more information. All of our products are made from the fresh milk from our family dairy farm. Preorders are appreciated at gable@conebellafarm.com. Mike will have a selection of produce including: Fuji apples, Yukon potatoes, and mini garnish pumpkins. He’ll also have apple cider and Fruitwood’s own local honey. Mark and Brigette will have Crimini, Portobellos, Shiitake and Gray Oysters, Yellow Oyster, King Oyster, Pom Pom, and Maitake. Stop by to try their pumpkin spice tea, and mushroom jerky. Please email Mark at mgarner@ksssales.com with questions or special orders. We welcome October with taking turkey orders this week at the market for Thanksgiving (only 7 weeks away). Our turkeys are all natural, pasture-raised, free -range with lots of sunshine. We will have all sizes from 8- 28 lbs. We are even offering fresh duck and fresh whole goose for Thanksgiving. Stop by our market this Wednesday for fresh ground turkey, fresh boneless/skinless turkey, fresh chicken, farm fresh eggs, and lots of beef, pork, and lamb for healthy meals. Online Thanksgiving turkey orders can be placed here. It’s pumpkin pie season! Pre-orders are highly recommended. Call 610-459-1869 or email, Marie@myhousecookies.com. New Road Brinery will have their new Mediterranean rub. With 12 different herbs and spices, it’s great for all meats as a seasoning, or rub for grilling or roasting. They’ll also have a selection of their usual pickled veggies. 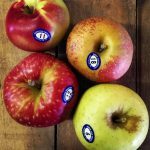 This week…oh boy, the apples! Sugar Snap are in!! Plus Crimson Crisp, Royalty, Adam’s Pearmain, and SO many more. We’ll have you eating 2 or 3 apples a day. (Hey, if an apple a day keeps the doctor away, try 2 a day and keep two doctors away!!). We’ll also have some of your favorite fall veggies. WoodsEdge will have their lean, low cholesterol, naturally raised yak meat as well as honeys, candles and alpaca wool goodies.